A test article of the lifting body Dream Chaser spaceship built by Sierra Nevada Corp., one of several companies receiving NASA funding to develop a commercial space taxi, made a crash landing on a runway at California's Edwards Air Force Base on Saturday, sources and news reports said. Engineers blamed the mishap on a problem during deployment of the Dream Chaser's left landing gear, which is derived the main gear used by the U.S. Air Force's F-5E Tiger fighter jet. 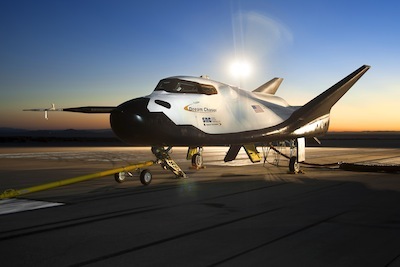 The test flight over the Mojave Desert was conducted autonomously - without a pilot in the cockpit - after the Dream Chaser's release from a Sikorsky S-64 helicopter operated by Erickson Air Crane at 11:10 a.m. Pacific time (2:10 p.m. EDT; 1810 GMT), according to Sierra Nevada. "Following release, the Dream Chaser spacecraft automated flight control system gently steered the vehicle to its intended glide slope," Sierra Nevada said in a statement. "The vehicle adhered to the design flight trajectory throughout the flight profile. Less than a minute later, Dream Chaser smoothly flared and touched down on Edwards Air Force Base's Runway 22L right on centerline." Sierra Nevada officials said earlier this year each landing test would begin with a drop from 12,000 feet and last between 30 and 40 seconds as the Dream Chaser flies at an approximately 23-degree glide angle, ending with a flare maneuver about 300 feet above the desert and touchdown at a speed of more than 200 mph. "While there was an anomaly with the left landing gear deployment, the high-quality flight and telemetry data throughout all phases of the approach-and-landing test will allow SNC teams to continue to refine their spacecraft design," the Sierra Nevada statement said. Mark Sirangelo, Sierra Nevada's corporate vice president for space systems, said the flight was "largely a successful test that had a nonflight issue on landing." The Dream Chaser is designed to take off on top of a United Launch Alliance Atlas 5 rocket, deliver up to seven astronauts to the International Space Station, and return to Earth with a runway landing like the space shuttle at the Kennedy Space Center in Florida. With a wingspan of 22.9 feet and length of 29.5 feet, the Dream Chaser is about one-third the size of a space shuttle orbiter. The Dream Chaser vehicle flown by Sierra Nevada on Saturday is a full-scale engineering test article and the first flight worthy Dream Chaser to be built. A statement posted on a NASA website said no personnel were injured in Saturday's flight, and officials are assessing damage to property. Air Force emergency personnel responded to the scene as a precaution, according to NASA. "Support personnel are preparing the vehicle for transport to a hangar. Sierra Nevada Corporation engineers, NASA Dryden Flight Research Center and U.S. Air Force representatives are looking into the anomaly that occurred," the NASA statement said. At the end of its first free flight, the Dream Chaser flipped over on the runway due to the mechanical failure on the craft's left main landing gear, according to a report posted by NASASpaceflight.com. NASA and Sierra Nevada have a Space Act Agreement to provide up to $227.5 million of NASA funding to the company. NASA makes payments as Sierra Nevada completes Dream Chaser design and development milestones. One of the milestones tied to a financial payment was the completion of approach and landing test. Upon meeting predetermined success criteria, Sierra Nevada was set to receive $15 million at the conclusion of the milestone. 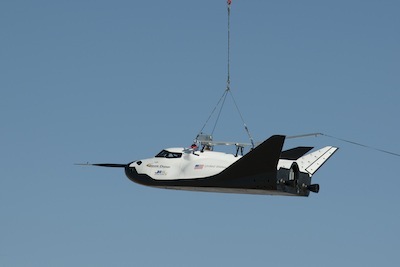 The Space Act Agreement describes the test this way: "A minimum of one and up to five additional Engineering Test Article free flight test(s) will be completed to characterize the aerodynamics and controllability of the Dream Chaser Orbital Vehicle outer mold line configuration during the subsonic approach and landing phase." The test's success criteria was redacted in a copy of the Space Act Agreement posted online. Sierra Nevada, headquartered in Sparks, Nev., with Dream Chaser development based in Louisville, Colo., planned to construct another test vehicle in 2014 for piloted landing tests and an abort demonstration to prove the Dream Chaser could safely escape an exploding rocket and land on a runway. Saturday's landing test was the first of a series of runway approach tests planned by Sierra Nevada to test its aerodynamic stability and gliding properties. No information was available Saturday evening on the extent of the damage to the Dream Chaser test article or whether it could be repaired for further flights. The Dream Chaser flown Saturday used a main landing gear modified from the U.S. Air Force's F-5E Tiger fighter jet. Dream Chaser's nose gear is a custom-designed skid. Future Dream Chaser vehicles will use a different type of landing gear with electric actuators, said Steve Lindsey, a former astronaut and Sierra Nevada's director of flight operations, in an interview last year. In the last three months, Sierra Nevada put the Dream Chaser test vehicle through a series of tow tests behind a pickup truck on the runway at NASA's Dryden Flight Research Center, which is co-located at Edwards Air Force Base in California. Sierra Nevada also lifted the Dream Chaser under the Erickson Air Crane helicopter on two captive-carry tests reaching a maximum altitude of approximately 12,400 feet. The captive-carry tests checked out the craft's computers, instrumentation and steering and landing systems, according to NASA. NASA's Space Act Agreement runs through August 2014 and includes other milestones, including risk reduction testing, wind tunnel testing, rocket thruster testing, and safety and schedule reviews. NASA has similar agreements with Boeing Co. and SpaceX worth $460 million and $440 million, respectively. The space agency expects at least one of the companies will be ready to ferry astronauts to the space station by 2017. Two previous agreements running from 2010 to 2012 provided $125 million in federal funding to go toward the Dream Chaser program. The space agency also has a $10 million contract with Sierra Nevada to begin the process of ensuring the Dream Chaser meets stringent safety requirements for astronauts.